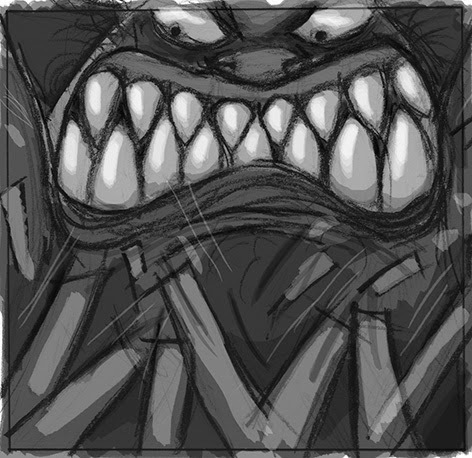 Towards the end of last year, one of my major assignments involved storyboarding a narrative of my choice. As children's picture books and stories played such a vital role in my childhood and beyond, I regarded this as an opportunity to explore the process of illustrating a children's text. 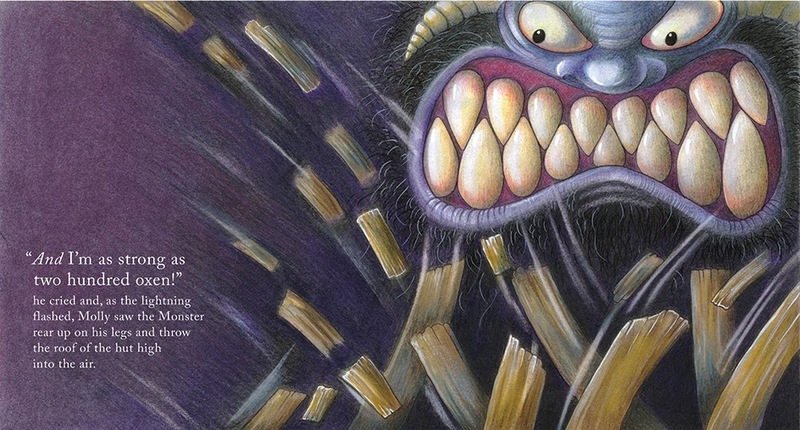 The story I chose to illustrate is called "Brave Molly" by Terry Jones, which is from a book of short tales by the author called "Fairy Tales" (Puffin Books, 1981). I love this collection of stories. They are a perfect mix of fantasy, humour, darkness and danger - all of which, I believe, are the essential components of a good fairytale. Besides, who doesn't love Terry Jones...he was always my favourite Python and he's worked with Brian Froud (the 'Lady Cottington' books). Anyway, "Brave Molly" is a terrific little story about a small girl who encounters a big monster when she seeks shelter in an abandoned cottage to escape a thunderstorm. Ultimately, she discovers that the monster is not what he seems and finds her courage in the process. The story is full of fantastic imagery to illustrate and besides being very laborious and a steep learning curve, this whole process was a complete joy for me. I thought I'd share the process for one of the completed spreads here and then post more as I complete the final versions. 1. 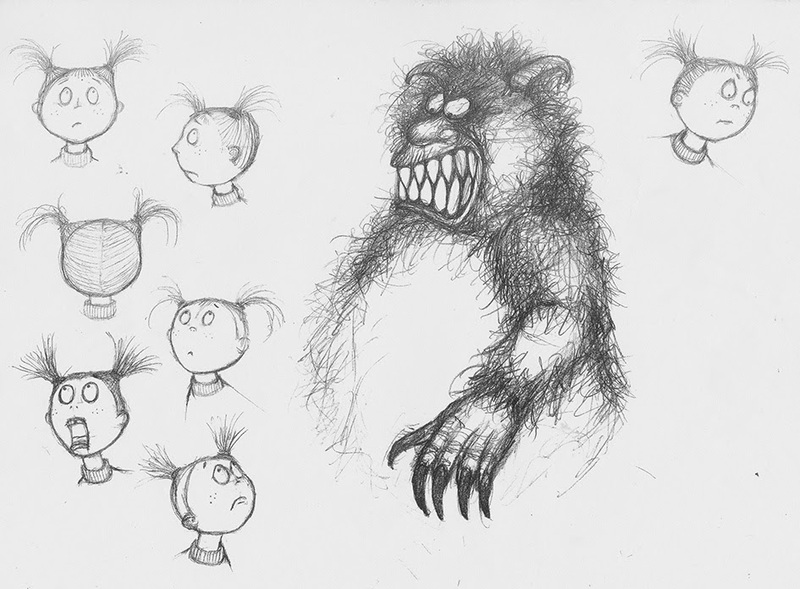 Initial sketches for Molly and the Monster. the concept I chose to go with so I've just shown one of the alternatives). 3. Tonal study for chosen cell. 4. Colour rough for spread. 6. Final spread with type. It seems you have found another part of your creative soul. I think the expressiveness that illustration can present itself above and beyond a lone sculpture, is priceless to my imagination.Your work is so inspiring and I am excited for you and anxiously await your first book when it makes it's way into the world. My photography is becoming that for me. It combines all the elements of storytelling that I adore and I am so consumed in passion for it.I have never felt this way before about creating and I am totally in bliss with it. Thank you for sharing your awesome creative process with us you friends and fans.